On June 13, 2013, the Supreme Court issued a unanimous decision holding that “genes and the information they encode are not patent eligible simply because they have been isolated from the surrounding genetic material.” See Association for Molecular Pathology v. Myriad Genetics Corp. (AMP), 133 S. Ct. 2107, 2120 (2013). Attorney Sewell’s publication entitled “Unanimous U.S. Supreme Court and Angelina Jolie: BRCA1 & BRCA2 Patentability” is widely disseminated, well-received by his peers, and sparks considerable commentary. In somewhat of a twist, the Supreme Court’s decision against the patentability of isolated DNA prompted more—not less—litigation by Myriad regarding gene patents. Between 1997 and 2013, Myriad’s revenue from its BRACAnalysis test steadily increased, and totals more than $2 billion. BRACAnalysis is a genetic test that confirms the presence of BRCA1 or BRCA2 gene mutations, responsible for the majority of breast and ovarian cancers. Myriad earned that revenue by carefully guarding its patent rights and preventing others from providing screening tests for the BRCA1 and BRCA2 genes. From the mid-1990s, until the Supreme Court’s AMP decision, Myriad was the lone provider of full-sequence BRCA1 and BRCA2 tests in the United States. Within days of the Supreme Court’s AMP decision, Defendant Ambry Genetics Corporation announced plans to sell tests less expensive than Myriad’s to screen BRCA1 and BRCA2 genes. Ambry Genetics Corporation is a clinical diagnostic and genomic services company in Aliso Viejo, California. Defendant now offers a menu of at least six tests that include screening for BRCA1 and BRCA2: a combined BRCA1/BRCA2 test, BRCAPlus, BreastNext, PancNext, Ova Next, and CancerNext. Defendant’s BRCA1/BRCA2 test is available for $2,200—substantially less than the price for comparable testing offered by Myriad. Soon after Defendant Ambry made its announcement, Myriad filed a complaint in the District Court of Utah alleging that Ambry’s genetic testing infringes several of Myriad’s patents. Myriad also moved for a preliminary injunction to enjoin Defendant Ambry from sales or offers to sell “genetic tests including a BRCA1 or BRCA2 panel”. 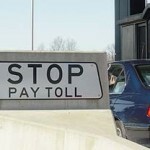 Ambry opposed the motion, alleging that the claims were invalid under 35 U.S.C. § 101 et seq. 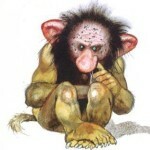 The district court divided the Myriad gene patent claims at issue into the Primer Claims and the Method Claims. On March 20, 2014, the Utah District Court held that Plaintiffs are not entitled to a preliminary injunction because “although Plaintiffs have shown they are likely to be irreparably harmed if an injunction does not issue, Defendant has raised substantial questions concerning whether any of the patent claims at issue in Plaintiffs’ Motion are directed toward patent eligible subject matter under 35 U.S.C. § 101”. Myriad then appealed to the Federal Circuit the denial of its motion for a preliminary injunction. On October 6, 2014, Chief Judge Prost and Judges Dyk and Clevenger of the U.S. Court of Appeals for the Federal Circuit heard oral argument in the interlocutory appeal of the Utah district court’s denial of Myriad’s motion for preliminary injunction against Ambry Genetics. In re BRCA1- and BRCA2- Based Hereditary Cancer Test Patent Litigation, Case Nos. 14-1361, -1366. The two main issues that dominated the argument are: 1) the correct implementation of the test for patent eligibility; and 2) the application of this test to probes and primers. The impact on the biotechnology industry was also discussed. Jonathan E. Singer, counsel for Myriad, began by arguing that both the Federal Circuit and the Supreme Court had previously acknowledged that Myriad was entitled to patent some applications of their newly-discovered gene sequence and tools designed specifically to utilize that sequence. Myriad argues that primer pairs are patent subject matter eligible under 35 U.S.C § 101 because the pairs are structurally and functionally different than a single fragment of DNA. Counsel for Myriad also argued that, as a whole, the method of screening for alterations on the BRCA genes involves steps of the method claims, when considered together, effect an improvement in a technical field – by using Myriad’s probes and primers that Myriad invented. With respect to the primer claims, Ambry argues that these claims are patent-ineligible because, in addition to reciting patent-ineligible products of nature, the claims fail under Alice because they are a generic component used to amplify a person’s gene sequence to access the sequence information for the patent-ineligible sequence comparison. As for the method claims, Ambry argues that under Alice, “the combination of unpatentable subject matter and a generic physical application is no more patent eligible than a claim reciting only the unpatentable subject matter.” See Ambry Supplemental Brief at page 3. What is clear from the district and appellate court arguments is that it does not appear likely that Myriad will be successful in its attempts to preliminarily enjoin Ambry. Additionally, the biotechnology industry is looking towards the Federal Circuit for guidance on the correct implementation of patent subject matter eligibility under Myriad, Mayo, and Alice. 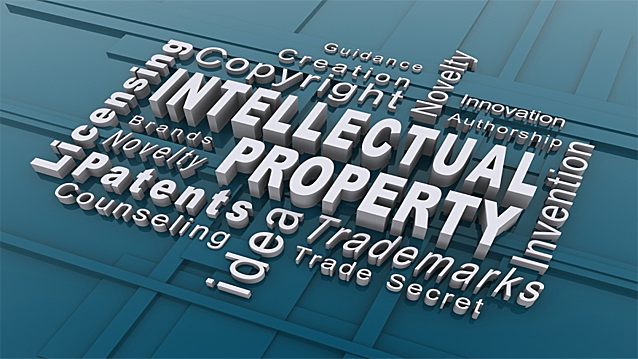 Intellectual property (patents, trademarks, copyrights, trade secret) is all around us and is valuable. The things that we use, watch, and buy are items that were thought of and then put into practice. Attorneys at the New York LAW FIRM OF DAYREL SEWELL, PLLC protect your intellectual property, so that you can maximize value. The majority of our attorneys possesses scientific training and is well-experienced in the litigation and prosecution aspects of patents, trademarks, copyrights, trade secrets, licensing, unfair competition, and more. Our passion and commitment is unmatched and is one of several aspects that set us apart from our peers. We care. As a result, our clients receive legal expertise with individualized attention by attorneys who are invested in the outcome of your matters. Our clients realize the value that this law firm delivers and are committed to a long-term, rewarding, attorney-client relationship. 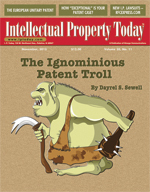 The LAW FIRM OF DAYREL SEWELL, PLLC is pleased to announce that Mr. Sewell’s article, “The Ignominious Patent Troll”, found below is the featured publication on the cover of the current issue of Intellectual Property Today. You are encouraged to subscribe to the firm’s complimentary blog and press release subscription services. We look forward to your comment.